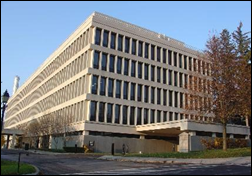 ONC has posted the agenda for its annual meeting to be held November 29-30 in Washington, DC. Day One begins with a welcome from Jared Kushner, director of the White House Office of Innovation, followed by a heynote from HHS Secretary Alex Azar. Breakout sessions will cover international health IT efforts, disaster response, HIEs, APIs, FHIR, and an “Ask the ONC Clinical Team” session. Day Two includes a fireside chat with National Coordinator Don Rucker, MD along with Senators Lamar Alexander and Tammy Baldwin. Value-based care is the chief buzzword for many healthcare organizations and the Comprehensive Primary Care Plus (CPC+) initiative was touted as a way to end the chicken-or-egg struggle faced by ambulatory organizations as they try to figure out how to pay for better care coordination that will lead to incentives that can help them pay for better care coordination and more comprehensive care. The American Academy of Family Physicians has called on CMS to modify the window between when practices have access to their Performance-Based Incentive Payment reports and when they have to repay incentives plus interest. The reports were to be available around September 26 with interest starting to accrue on October 18. There’s a 19-month gap between performance and reporting, but the CMS piper expects to be paid within a month. The Medicare Shared Savings Program gives Accountable Care Organizations 90 days to repay shared losses. If the current timeline holds, it’s yet another barrier to practice participation in what is supposed to be a driver towards value-based care. It’s clear that the focus on quality and value isn’t changing any time soon. CMS is hosting a National Provider Call on October 30 to talk about Physician Compare and the upcoming release of publicly available Quality Payment Program data for 2017. A 30-day preview period will allow providers to review their information before it is posted for all to see. The session will include time for question and answer, so if you’re not sure how to navigate the release of information or what to do if you feel it’s not accurate, I’d recommend attending. Telemedicine is growing and I’ve considered dipping my toe in the waters as an opportunity to deliver patient care without spending 12- to 14-hour shifts in the trenches. Consumer Reports is bringing a recent Annals of Internal Medicine study to the masses regarding increased antibiotic prescriptions issued during telemedicine encounters. The study suggests that there is an association between the length of the visit and the likelihood of an antibiotic prescription. It looked at 13,000 telemedicine visits performed for patients with respiratory complaints. More than 65 percent of phone encounters resulted in an antibiotic prescription. Unfortunately, the research team didn’t have access to the actual encounter documentation so there was not a solid way to determine whether the antibiotic prescriptions were appropriate. The article offers good information on being an informed telemedicine patient, and notes that “patients often view a telemedicine encounter as more of a consumer transaction than a healthcare visit … here’s an expectation that they get to call a doctor, pay for the visit, and get a prescription.” The author encourages patients to write down their symptoms first including when they started, which is good information for any patient seeking care. Physician practice management publications such as Medical Economics are encouraging providers to bill telemedicine codes for their own patients. Close to 30 states have so-called telemedicine parity laws, which require commercial payers to reimburse telemedicine services at the same level as face-to-face visits. There are some nuances to coding, though, and physicians are wise to investigate their payer contracts as well as the requirements for proper coding of phone visits. Many of the scribes in my practice are applying to medical school or physician assistant programs. Those that know I’ve spent time as an administrator often ask about that career path and opportunities in healthcare should they not be admitted to the program of their choice. Money isn’t everything, but I’m happy to share the trend in hospital executive salaries with them. The study looked at CEO and CFO compensation at 22 non-profit medical centers in the US using the “US News & World Report” hospital honor roll list from 2016-17 along with four notable health systems. The authors looked at the growth of clinical worker wages compared to nonclinical workers and management workers. The rise in value-based care demands administrators with strong financial and quality management backgrounds, which may be driving increased executive salaries. Operational leaders are also in demand as health systems retool their strategic plans. 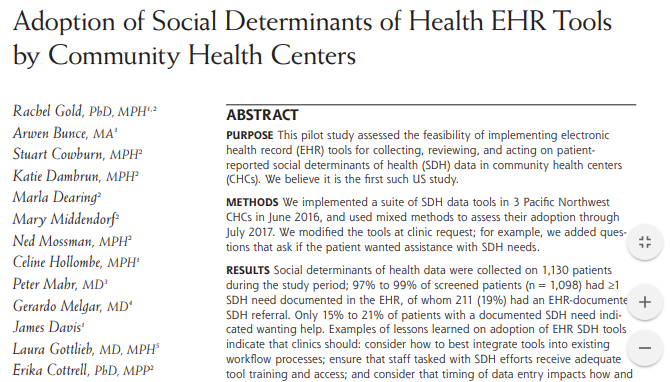 Still, the authors conclude that “there does not appear to be a proportionate increase in healthcare utilization. These findings suggest a growing, substantial burden of non-clinical tasks in healthcare. Methods to reduce non-clinical work in healthcare may result in important cost savings.” I don’t know of too many physicians who would disagree with that sentiment. 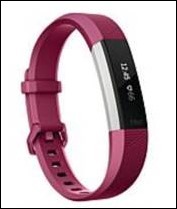 Interesting news for patients who rely on fitness trackers as a tool to assist with their fitness goals. The British Journal of Sports Medicine reports that many trackers aren’t good at measuring energy expenditure. The authors reviewed data from 60 studies looking at 40 trackers worn on the arm or wrist. Devices tended to underestimate energy expenditure, but those that also measured heart rate were more accurate. As an experiment, I used my Garmin watch on the treadmill in “indoor” mode and found that it, too underestimates the mileage my treadmill says I’m logging. The Garmin is accurate in GPS mode when I take it outside for a workout, so it’s still my wearable of choice. There was quite a bit of buzz in the physician lounge this morning about the FDA approval of Xofluza, which is the first new anti-influenza agent in roughly 20 years. It’s a single dose and can be used to treat patients age 12 and older as long as they’re diagnosed within the first 48 hours of illness, similar to current medications. The wholesale price has been set at $150, but the retail price hasn’t been listed. Genentech makes it and will be offering a coupon for patients with commercial insurance that allows them to purchase it for $30. Now we’ll have to see how quickly EHR teams can get the drug updated for easy prescribing. How quickly can you get a new drug into your providers’ virtual prescription pad? Leave a comment or email me. Rachel Marano is managing partner and co-founder of Pivot Point Consulting of Brentwood, TN. I’ve spent my entire career in healthcare IT, almost 18 years. I’m a computer science graduate. 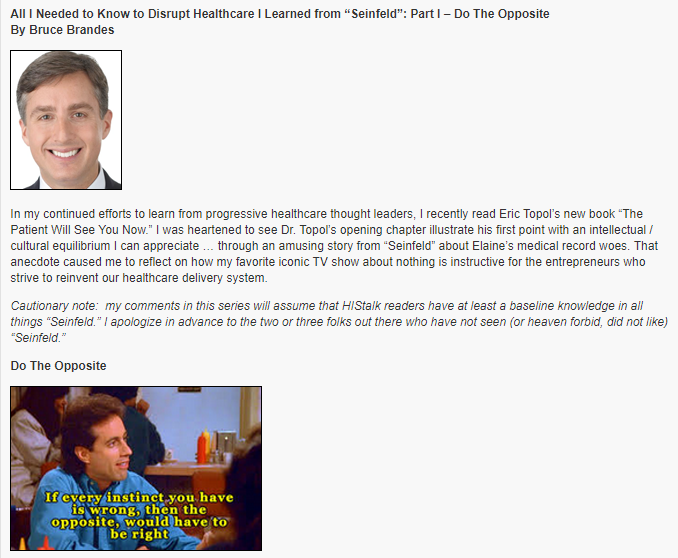 I started my first job at Cerner, where I learned the healthcare IT industry through the Cerner consulting concept. I eventually moved into the hospital side, going to work for Advocate Health Care to get off the road. I did a good bit of implementation and then worked my way into the Epic space and became a certified consultant for a variety of consulting companies. I did everything from build to project management at the project director level. I launched Pivot Point Consulting in April 2011 with the intent of continuing in the healthcare IT industry, but as a consulting group and a vendor. I’ve seen multiple angles of the industry — software development, the hospital side, the consulting side, and now as an entrepreneur in the healthcare IT space. What are the most important things you learned from working with Cerner and Epic and their products? Their products are achieving the same goal, but have different ways of getting there. Both have strong implementation methodologies. Obviously their philosophies and corporate cultures are different. Cerner’s support model is different from Epic’s. Pivot Point Consulting serves both markets. I’ve worked on both sides and have seen the advantages of both systems, the integration, and how they play in the industry. My roots are Cerner and I spent a good part of my career in Epic, so I think they are equally important in this industry. They create tremendous value for organizations. Many of our consultants have found themselves in both worlds over the years. Cerner has made a lot of advances in their interoperability and in the international market, which has given them many additional clients. Epic continues to grow domestically and internationally. Epic has a unique way of managing the implementations — giving feedback, doing progress reporting, and ensuring success in install, implementation, and outcomes — which is different from how Cerner manages its clients. They are different animals, with both achieving the same end goal but with different paths to get there. We’ve seen tremendous success with our clients on both products. How has hospital and health system consolidation affected the consulting business? It’s certainly a different landscape when there is a lot of merger and acquisition activity. But by definition, that creates opportunity for migration, implementation, and optimization in consolidating older systems to one standard system. It has created a lot of strategy, advisory, and assessment-level work for us and in the entire industry. We’ve done quite a bit of M&A work in the last few years in helping with pre-planning, organizational IT strategic planning, and infrastructure planning for M&A. We’re doing a large M&A strategy session right now with an organization in downstate Illinois. They didn’t know how to approach the amount of M&A they will be going after in the next 10 years and how that would affect them operationally, strategically, and financially. We put together roadmaps. Consolidation has, from a consulting perspective, allowed us to look at the industry differently and to see the future state of where these systems will be. Many of them will be unified, integrated, and on similar platforms instead of best-of-breed. We’re going to see a lot more organizations on one platform where they can transfer data more easily. Are large health systems in less of a hurry than before to rip and replace the systems of the hospitals they acquire in favor of the corporate standard? One of our larger clients spent probably $200 million on Epic implementation over the years. They were bought by a much larger organization. Things are integrated between the two systems other than the Epic instances. The large organization is maintaining its existing Epic instance and the smaller organization will maintain its Epic instance. They’re both on Epic, but they are running independently by design. The sheer cost of starting again, redefining workflow, and standardizing all these things between the two systems almost makes the juice not worth the squeeze after these organizations have spent so much money. 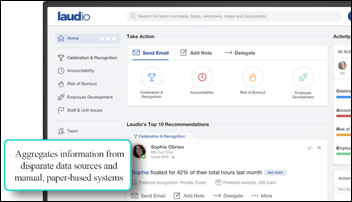 Things are working, they’re getting the reporting that they need, they’re compliant, and their workflows and operations are efficient with those instances. It makes great sense for some organizations, less for others. Ultimately cost, resourcing, staffing, and other competing projects all come into play into that decision-making. But for some organizations, once they sign on the M&A dotted line, they’re moving forward and starting with the migration. What projects are floating to the top of health system lists? We’re seeing a lot of patient engagement, population health, privacy and security, optimization. A lot of managed services, outsourcing the support of these systems. More organizations are shifting energy away from EHR to ERP. The concentration is now that we have the data, what do we do with it? How are we using those measurements to improve performance, clinical outcomes, return on investment, and cash flow? It’s a much more advanced space. Almost all of our clients are focused heavily on patient engagement initiatives in one way or another. How patients are interacting with their patient portals and what their experience is like from a technology perspective. Systems are in place, we’re live, software is working. Operations, workflow, and clinical and revenue cycle are functional. Where do we go from here in these Phase 2, 3, and 4 post-live scenarios? 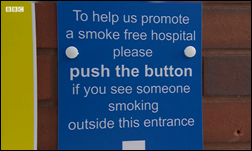 Do health systems know what they want to do with population health and patient engagement or are they looking for direction? Both. 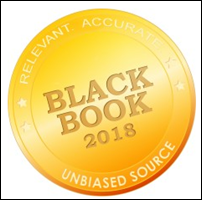 More-tenured organizations that have been on these EHR platforms and have software, analytics platforms, or tools are much further ahead in deciding what their initiative looks like or what it should mean. We have small organizations that haven’t even said the word. They’re looking for our guidance and our advisory around the right moves. What tools should we be working with? What vendors are good in this space? Should we be bringing Healthy Planet live? Should we be doing some type of integration? Most of our large organizations are already underway and have someone leading the charge with population health in some regard. Some of our smaller organizations that might be a little bit further behind are looking for direction and directive. Some don’t know how to approach it, it’s lower on their list, and they’re still trying to get their technology in order. What do CIOs tell you is the hardest part of their job? I haven’t heard as much about CIO turnover. You’ll see it with M&A, but jobs are also evolving into other areas. Some of our CIOs are more focused on innovation and driving revenue into the IT department where before it was more about creating a specific technology infrastructure. Their challenges continue to be resourcing. I hear this consistently. How do we continue with additional future-state projects with the existing staff? How do we leverage organizations and potentially managed services or outsourced solutions to maximize our organizational resourcing? Definitely innovation. We have CIOs who are focused on developing programs internally in their IT departments to drive revenue, to create revenue-generating entities within their organization that can align potentially with their IT shop. Potentially consolidating efforts with other local hospitals, leveraging other IT departments and their resources. We’ve seen a lot of unusual approaches to the post-EHR implementation world in CIO roles and evolving how they play in their organizations. 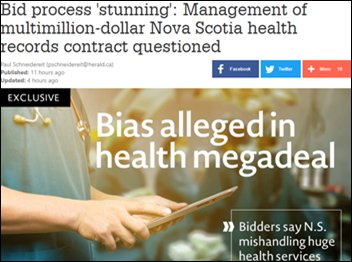 What are the issues most commonly involved when a health system calls you wanting to replace an incumbent consulting firm? Typically we find that organizations are unhappy with the relationship, the level of consultant talent, or potentially the level of experience and ability. A lot of times, we’re called on because they’re unhappy with the level of service. But we also find that organizations are looking for a firm that can do more than just one thing and can cast a wider net of service offerings. 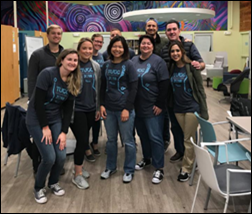 The group understands their culture, nuances, and their uniqueness and are able to go in other directions, whether it be at an advisory level, a managerial level, legacy, potentially on revenue cycle or clinical, training, and managed services. We’ve seen a good bit of that and we’ve seen organizations that are looking for companies at a certain KLAS level, where they’ve had vendors that have fluctuated in that KLAS standing. Organizations consistently say they’re looking for vendors within the top 10 in their category and that’s who they stick with. Our focus is relationships, trusted advisory, strategic connections with our clients, and offering value. 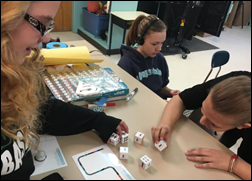 Being able to identify a challenge and provide a solution. We can do that at more of a strategic level, but also with staffing. We’re trying to approach it differently. We definitely do staffing, but we’ve always been a firm that has been consultant led and consultant driven. We have a different vision on how we work with clients and how we engage with them. What are the biggest opportunities and threats for health systems, CIOs, and companies in the next 3-5 years? Merger and acquisitions. We’re going to see in the next 10 years more and more organizations being consolidated, with fewer and fewer independent organizations. The challenges come with combining facilities, the cost of doing that, and technology integration. That will drive the future of the healthcare market. The continued advancement in the technology itself will also change how we are leveraging data. Our organization is evolving and certainly has changed over the years. When Pivot Point started, we were focused pretty heavily on Epic and Cerner implementation. At that time, that was where the industry was, and that was the main focus of most organizations. We have changed with the times and evolved with the industry and continue to meet the needs of our clients. We have cast a wider net into some of these divisions, departments, and areas where we see challenge and opportunity. A lot of that is around that managed services space and assisting clients with post-live initiatives. 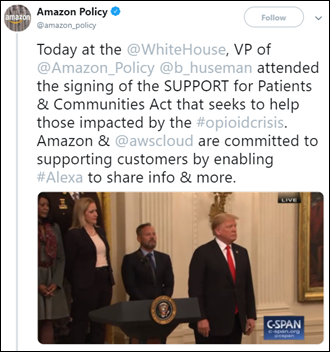 We’re going to continue to see more organizations putting energies in and around that as well as the strategic and more challenged areas around privacy and security, population health, mobility, and even compliance and infrastructure and technology. We feed Statistics as an Input and some Rules. It provides an Output. 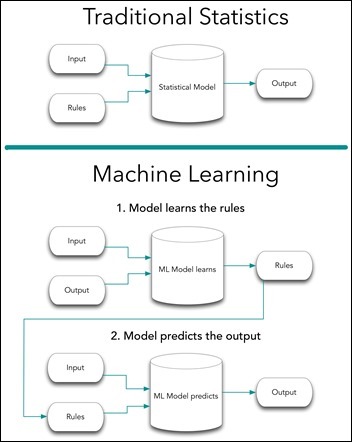 We feed ML an Input and the Output and the ML model learns the Rules. This learning phase is also called training or model fit. Then ML uses these rule to predict the Output. In an increasing number of fields, we realize that these rules learned by the machine are much better than the rules we humans can come up with. With the above in mind, the difference between supervised and unsupervised is simple. Supervised learning. We know the labels of each input instance. We have the Output (discharged home, $85,300 cost to patient, 12 days in ICU, 18 percent chance of being readmitted within 30 days). 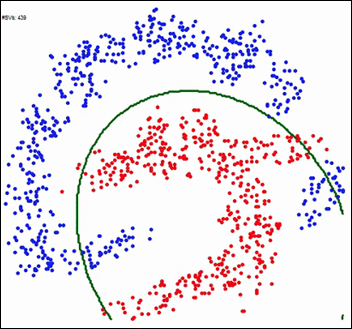 Regression to a continuous variable (number) and Classification to two or more classes are the main subcategories of supervised learning. Unsupervised learning. We do not have the Output. Actually, we may have no idea what the Output even looks like. Note that in this case there’s no teacher (in the form of Output) and no rules around to tell the ML model what’s correct and what’s not correct during learning. 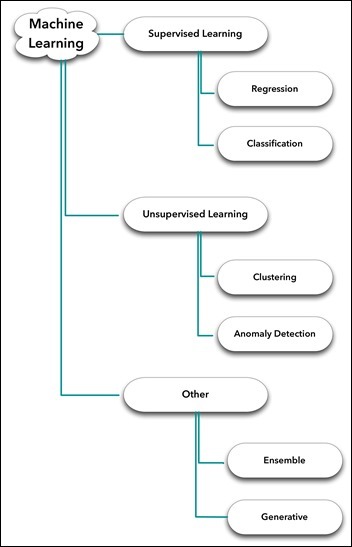 Clustering, Anomaly Detection, and Primary Component Analysis are the main subcategories of unsupervised learning. Other. 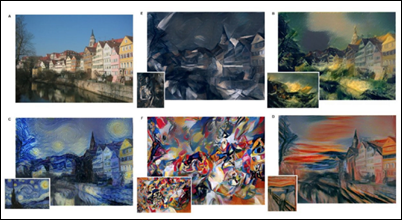 Models working in parallel, one on top of another in ensembles, some models supervising other models which in turn are unsupervised, some of these models getting into a “generative adversarial relationship” with other models (not my terminology). A veritable zoo, an exciting ecosystem of ML model architectures that is growing fast as people experiment with new ideas and existing tools. With regression problems, the Output is continuous — a number such the LOS (number of hours or days the patient was in hospital) or the number of days in ICU, cost to patient, days until next readmission, etc. It is also called regression to continuous arbitrary values. Let’s take a quick look at the Input (a thorough discussion about how to properly feed data to a baby ML model will follow in one of the next articles). At this stage, think about the Input as a table. Rows are samples and columns are features. If we have a single column or feature called Age and the output label is LOS, then it may be either a linear regression or a polynomial (non-linear) regression. 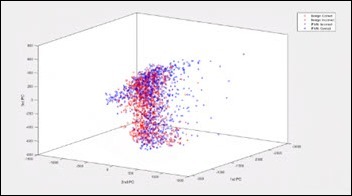 The Task is to find the best straight line between the scatter points below – LOS vs. age – so that, in turn, can be used later for prediction of new instances. The Experience is all the X and Y data points we have. The Performance will be measured as the distance between the model prediction and the real value. From “Linear Regression the Easier Way,” by Sagar Sharma. What happens when the relationship between our (single) variable age and output LOS is not linear? The Task is to find the best line — obviously not a straight line — to describe the (non-linear) polynomial relationship between X (Age) and Y (LOS). Experience and Performance stay the same as in the previous example. From “R-english Freakonometrics” by Arthur Carpentier. Life is a bit more complicated than one feature (age) when predicting LOS, so we’d like see what happens with two features — age and BMI. How do they contribute to LOS when taken together? 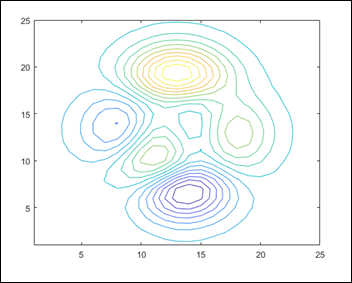 The Task is to predict the Z axis (vertical) with a set of X and Y (horizontal plane). The Experience. The model now has two features: age and BMI. The output stays the same: LOS. Performance is measured as above. 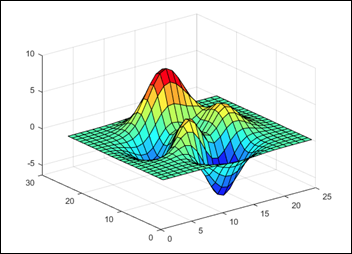 Find the following peaks chart — a function — similar to the linear line or the polynomial line we found above. 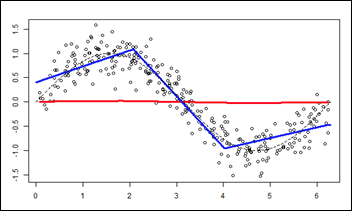 This time the function defines the input as a plane (age on X and BMI on Y) and the output LOS on Z axis. How does a 4D problem look? From “Doing Magic and Analyzing Time Series with R,” by Peter Laurinec. When the output is discrete rather than continuous, the problem is one of classification. Note: classification problems are also called logistic regression. That’s a misnomer and just causes confusion. Binary classification, such as dead or alive. Multi-class classification, such as discharged home, transferred to another facility, discharged to nursing facility, died, etc. 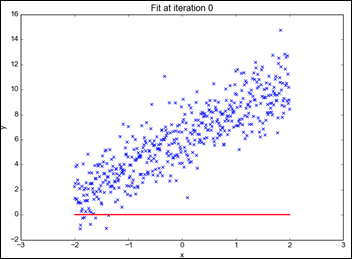 One can take a regression problem such as LOS and make it a classification problem using several buckets or classes: LOS between zero and four days, LOS between five and eight days, LOS greater than nine days, etc. 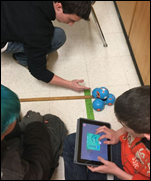 The Task is to find the best straight line that separates the blue and red dots, the decision boundary between the two classes. The Experience. Given the input of the X and Y coordinate of each dot, predict the output as the color of the dot — blue or red. Performance is the accuracy of the prediction. 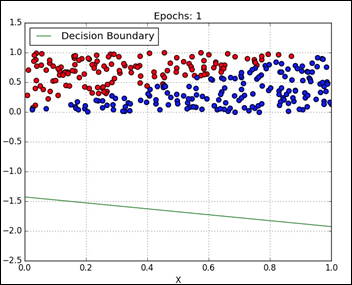 Note that just by chance, with no ML involved, the accuracy of guessing is expected to be around 50 percent in this of type of binary classification, as the blue and the red classes are well balanced. From “Classification” by Davi Frossard. A bit more complex dots separation exercise, when the separation line is obviously non-linear. Multi-class classification is actually an extension of the simple binary classification. It’s called the “One vs. All” technique. More about Classification models in the next articles. While the last example had two variables (X and Y) with one output (color of the dot), the next one has three input variables (X, Y, and Z) and the same output: color of the dot. The Task is to find the best hyperplane shape (also known as rules / function) to separate the blue and red dots. Experience has now three input variables (X, Y, and Z) and one output label (the dot color). From Ammon Washburn, data scientist. Click here to see the animated 3D picture. How can we visualize a problem with 5,000 dimensions? Unfortunately, we cannot visualize more than 4-5 dimensions. The above 4D chart (3D plus time) on a map with multiple locations — charts running in parallel, over time — I guess that would be considered a 5D visualization, having the geo location as the fifth dimension. One can imagine how difficult it would be to actually visualize, absorb, and digest the information and just monitor such a (limited) 5D problem for a couple of days. Alas, if it’s difficult for us to visualize and monitor a 5D problem, how can we expect to learn from each and every experience of such a complex system and improve our performance, in real time, on a prediction task? How about a problem with 10,000 features, the task of predicting one out of 467 DRG classifications for a specific patient with an error less than 8 percent? In this series, we’ll tackle problems with many features and many dimensions while visualizing additional monitors — the ML learning curves — which in my opinion are as beautiful and informative as the charts above, even as they are only 2D. On an artsy note, as it is related to the third group of ML models (Other) in my chart above, are models that are not purely supervised or unsupervised. Scoff you may, but this week, the first piece of art generated by AI goes for sale at Christie’s. Generative ML models have been trained to generate text in a Shakespearean style or the Bible style by feeding ML models with all Shakespeare or the whole Bible text. There are initiatives I’ll report about where a ML model learns the style of a physician or group of physicians and then creates admission / discharge notes accordingly. This is the ultimate dream come true for any young and tired physician or resident. I’d like to end this article on a philosophical note. As expected, the machines started writing computer code on their own. The computer software written by machines cannot be compiled nor executed and it will not actually run. I’ll leave you with this intriguing, philosophical, recursive thought in mind — computers writing their own software — until the next article in the series: Unsupervised Learning. Vatica Health makes a $1 million bid to acquire the assets of chronic care management company CareSync, which abruptly closed its doors in June. Politico reports that Pentagon investigators have found Madigan Army Medical Center’s new Cerner-based software lacking in effectiveness, suitability, and interoperability. Tabula Rasa HealthCare launches a new division called CareVention Healthcare that will offer consulting services and technology, including its medication risk management software. 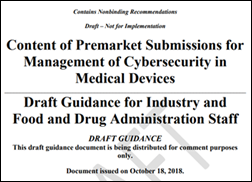 The FDA updates draft guidance on managing cybersecurity issues for the premarket submission of medical devices. Gauss Surgical raises $20 million in a funding round led by Northwell Health (NY) and SoftBank Ventures Korea, with help from seven other health systems. Vermont Information Technology Leaders struggles to pare down the number of duplicate patient records in the state’s HIE. FDA and DHS will work together to share information on cybersecurity vulnerabilities in medical devices so that threats to patient safety can be addressed more quickly. 1. Readers will give your content more credence if you write from a place of experience. Both authors of the aforementioned posts have MDs, and other in-the-trenches educational and professional experience to back up their right to editorialize. 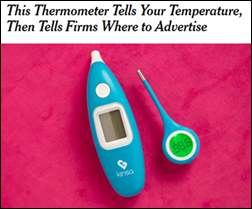 Vendor authors – unless they too have immense clinical chops – will never quite escape the subconscious bias of readers who see a company name in the byline and immediately worry their time is being wasted by someone trying to sell them something. 3. Pop culture and humor are always good bets, provided they are in good taste. (I’m still shaking my head at the submission sent over with a curse word in the headline.) 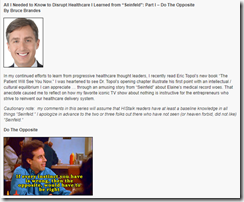 I often point interested parties to the “All I Needed to Know to Disrupt Healthcare I Learned from ‘Seinfeld’” series penned in 2015 by Bruce Bandes as a great example of original, humorous content that speaks to a timely topic. Gauss Surgical raises $20 million in a Series C funding round led by Northwell Health (NY) and SoftBank Ventures Korea, with help from seven other health systems. Funding thus far comes to $52 million. 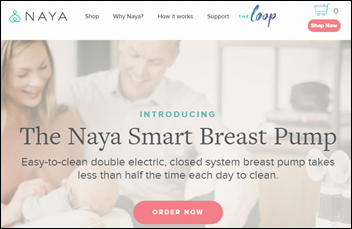 The company has developed tablet-based software that uses machine learning and digital imaging to monitor maternal surgical blood loss in real time. 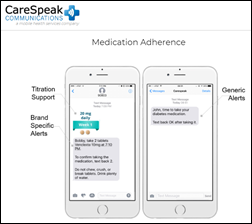 Digital prescription savings company OptimizeRx acquires interactive patient messaging vendor CareSpeak Communications for an undisclosed amount. Muscular dystrophy nonprofit CureDuchenne invests in ZappRx, and will help the vendor optimize its e-prescribing and electronic prior authorization software for Duchenne patients. 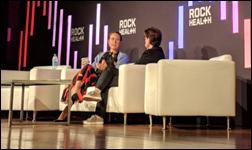 23andMe CEO Anne Wojcicki tells Rock Health conference attendees that she hopes to soon roll out a test that will help consumers better understand how their bodies react to certain antidepressants. Price points for similar services offered by Color Genomics and Albertsons grocery store pharmacists range from $250 to $750. The FDA shut down 23andMe’s first attempt at such a test in 2013 based on the fear that consumers could misinterpret the results as medical advice. Patrick Flavin (Outcome Health) joins Arches Technology as president. HCTec names Salome Isbell (MedHOK) CFO, Victor Ayers (Infor) VP of professional services, and Heather Espino (Centura Health) VP of clinical solutions. Bassett Medical Center (NY) adopts Masimo’s Patient SafetyNet and Root with Vital Signs Check across its 54-bed med-surg unit. Massachusetts EHealth Collaborative and Cognizant will provide technical and financial consulting services to the MassHealth Delivery System Reform Incentive Payment technical assistance program’s ACOs and community partners. Partners Connected Health adds a mobile app to its PGHDConnect program, giving users the ability to securely share health data with their providers from 250 devices. The FDA and Department of Homeland Security announce they will work together to share information on cybersecurity vulnerabilities in medical devices so that threats to patient safety can be addressed more quickly. 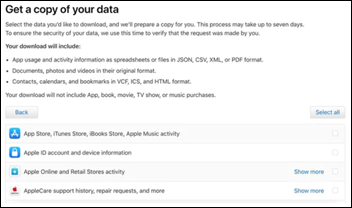 Following a similar GDPR-induced move in Europe, Apple gives US users the ability to view, edit, and delete data it has collected on them using a new tool on its privacy website. The tool does not apply to data collected by and stored on Apple devices, including biometric data like fingerprints and heart rates. The Sequoia Project creates the Interoperability Matters Advisory Group and solicits nominations for workgroup members who will provide feedback and recommendations on interoperability endeavors. I was not aware that Sequoia relinquished Carequality earlier this month to operate as a standalone entity. 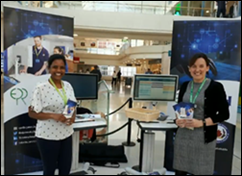 In Dublin, St. James’s Hospital goes live on expanded Cerner functionality, making it the largest EHR implementation in Ireland’s history. The three-year project was dubbed “Project Oak” as an homage to the paper the Millenium conversion will save. Vermont Information Technology Leaders struggles to pare down the number of duplicate patient records in the state’s HIE. An audit last year found 1.7 million unique records for 624,000 residents and patients from out of town. VITL staff have deemed at least 35 percent of those to be duplicates, and hope to have that number down to 21 percent by the end of the year. The struggle for a unique patient identifier in the Green Mountain State is real. EClinicalWorks will exhibit at CHCANYS18 Annual Conference and Clinical Forum October 21-23 in Tarrytown, NY. 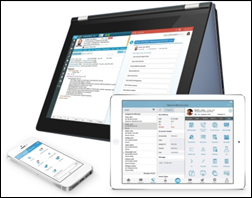 FormFast will host virtual user group meetings October 23 and 24. Healthwise will exhibit at the 2018 PNEG Conference October 19-21 in Fort Wayne, IN. Foundations Health Solutions wins an Excellence in Technology Award from McKnight’s for its use of Hyland OnBase. 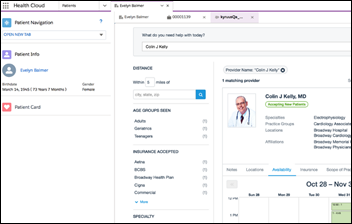 Formativ Health adds Conversa Health’s AI-powered chatbot messaging tool to its line of patient engagement services. Imprivata completes the Zebra Technologies Validated Program for its Mobile Device Access. Casenet becomes a founding member of the private-sector Da Vinci project, which aims to leverage FHIR to improve data-sharing in value-based care arrangements. ZeOmega adds MCG Health’s Cite AutoAuth prior authorization software to its Jiva population health management technology. 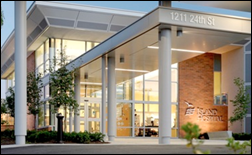 HCTec publishes a new case study featuring Montefiore Health System. NHS approves Elsevier as a supplier for its NHS England Health Systems Support Framework.